When you’re struggling to handle your money and stressed about paying the bills, good financial management can seem out of reach. But did you know that your finances can actually improve with just a bit of ongoing effort and diligence? Just like improving your tennis swing or your piano playing, you can develop smart money practices with some practice each day too. 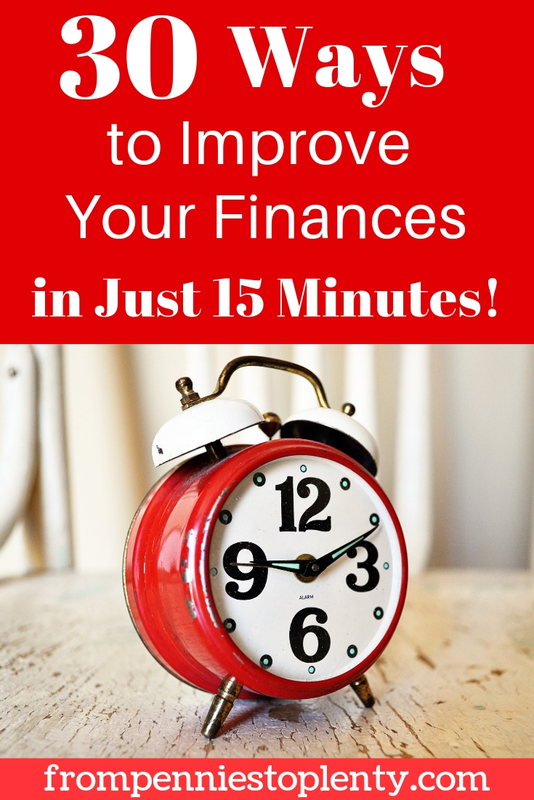 In fact, you may come away surprised at how much you can accomplish by tackling your finances in just 15 minutes a day. So today I want to share some things that you can do to improve your finances in the spare moments of your day. Your financial situation won’t change overnight, but you’ll find yourself more knowledgeable about finances and better at money management over time. One of the first things to do is to check your credit score. Your credit score is important because companies use it to determine how creditworthy you are. The higher the score, the better off you are. When you need a loan for a mortgage or a car, a higher credit score can help you get a lower interest rate, which saves you money in the long run. Being frugal-minded, I recommend not paying for your score when you can get it for free. Sites like Credit Karma and Credit Sesame can provide you your credit score for free. Your bank may provide it to you free as well. You can earn a higher interest rate in high-yield savings accounts than in a traditional savings account. A traditional savings account may offer you 0.01% interest while a high-interest savings accounts can earn you over 2%, meaning the difference between earning $0.10 and $20 on a $1000 deposit. The high-yield account may have a few more restrictions such as a limit on the number of transactions per month, but your money is available to you when you need it and it’s accruing interest when you don’t. A brokerage account is an investment account that allows you to buy and sell stocks, bonds, mutual funds, and more. You might spend some time deciding where you want to open one. Common firms include Fidelity, TD Ameritrade, Vanguard, Ally, and Charles Schwab. Once you know what company and type of account you want, you can create the account, fund it, and wait a few days for processing to complete. Don’t let having low funds discourage you from opening an account. Some accounts have no minimum so you can start investing today. It’s worth looking over your credit card statements each month before you pay the bill. Your credit card company can send you a hard copy of your bill in the mail, or you can get immediate access to it online nowadays. Check if your credit cards are being used fraudulently or you’re being charged extra fees. In the past, I’ve found mistakes such as being overcharged at a restaurant and being charged for a service I thought was canceled. Pay your bills before they come due. You’ll avoid unnecessary late charges, which would give you more stress and more to pay. Set reminders on your physical or electronic calendar so you know when bills are due. Then pay your bills online with a few clicks of the mouse or set up automatic payments so you don’t have to rely on a reminder at all. Just ensure that you have enough funds in your account on your scheduled payment dates. You can also ask your credit card companies to change your due dates to align better with when you have funds in your accounts. If you carry a balance on your credit card each month, make a call to your credit card company to see if you can lower your interest rate. Many credit card companies will work with you but you have to ask first. You may be able to negotiate other things too like dropping an annual fee, increasing your credit limit, or removing a rare late charge. A lean wallet is important for your financial safety. Take out any receipts and save the ones you need. Recycle or shred the rest. Then review your credit cards and remove the ones you don’t use. Even loose coins can go in a collection jar instead of weighing down your wallet. This will better protect you from identity theft and loss of funds if your wallet ever gets lost or stolen. Retail emails telling you of the latest sales are a slippery slope to unnecessary spending. Kick that habit to the curb by going through your inbox and unsubscribing from as many as you can. It only takes a few seconds to open an email, scroll down to the bottom, and click the unsubscribe button. If you’re afraid of missing out on the next sale, make a point to look for things you need when you know there are scheduled sales like during major holidays. But I bet you won’t even notice that the emails have stopped coming because you’ll be focused on other things. Similar to above, unsubscribe from unnecessary mail like retail catalogs and advertisements. That will keep you from browsing them and being tempted to spend on things you don’t need. You’ll help the environment too by cutting back on paper waste. Money is one of the major stressors in relationships. When finances aren’t going well, it can lead to misunderstandings and arguments. So check in with your partner regularly about each other’s spending and saving money. It doesn’t have to be a big hairy ordeal. Even 15 minutes a week or every few weeks can be enough for most couples to ensure they’re on the same page financially. Tracking your spending will help you determine where your money is going. Using an app or a pen and paper, jot down how much you spend and what you spent it on at the end of each day and tally it up at the end of the week. From there, you can plan on what to do next, whether that’s to adjust your budget, save in certain areas, or continue what you’re doing. The idea of sticking to a budget scares a lot of people away from even trying to start one. You’re already on your way to creating a budget once you’ve tracked your spending for a week. You can move on to starting a budget using pen and paper, a spreadsheet, or an app (see below). As for the consequences of failing to adhere to your budget, if you make a mistake and overspend in one category or save too little in another, give yourself some grace and try again tomorrow. Determining your income will help you create a more accurate budget. I prefer to calculate my take-home income after taxes, retirement contributions, and so forth are deducted. That’s going to affect how much I can actually spend in my everyday life. Take a look at your pay stub and multiply your take-home pay by the number of paychecks you receive in a year. If you have variable earnings, you can estimate your income by averaging your income from the past 3-6 months. Calculating your total debt may not sound fun, but it’s necessary to get on track financially. Note the lender, how much you currently owe on each loan, and each loan’s interest rate. You may be able to find all your debts listed in a credit report, which is free once a year from Equifax, Experian, and TransUnion. Knowing your total debt will help you shape your financial actions and future goals. Spend some time brainstorming your goals for the future. You may want to buy a home, save for a new baby, take a dream vacation, or throw a wild wedding. Write down whatever comes to mind. Don’t stop brainstorming or dismiss a goal because it seems too outlandish. After brainstorming your goals, the next step is to determine how to meet them financially. Many major life goals require months or years of planning to achieve. If you want to buy a house, you’ll likely have to save for years, which might mean tightening your budget, getting a higher-paying job, and taking on a second job or side hustles. Plan out your timeline and how you will earn the money to achieve those goals. Educational financial information is free and easily accessible nowadays. A quick online search for how to start a budget or money saving tips brings up news articles and blog posts like this one. You can read one a day in less than 15 minutes, although it may take some time and effort to implement. If you read one a day for a few weeks, you’re bound to gather some new financial knowledge. Podcasts are an easy way to learn more about personal finance without much hassle. You can consume podcasts in the in-between moments of your day such as during your morning commute or when you’re on a run. A few of the most popular personal finance podcasts are So Money and Smart Passive Income. Listen in installments over the course of a few days if you only have 15 minutes free a day. Your company may have amazing benefits that you’re not utilizing. My husband’s company provides a stipend to use on health expenses each year. I receive additional funds for health expenses every quarter through the San Francisco Medical Reimbursement Account. These add up to thousands of dollars in savings for us. Find out if your company has benefits such as 401(k) matching, health insurance options, workplace perks, life insurance, stock options, and flexible spending accounts. If your company offers a 401(k), you may have defaulted into a small contribution or none at all. Now’s a good time to check your investment options and see how much you’re contributing. The general rule is to contribute 10% of your income, but more is better. You can contribute up to the maximum is $19,000 in 2019 if you’re under 50 years old. Compounding interest will increase your savings even more, which means you’ll have more money saved when you retire. Another option to save for retirement besides a 401(k) is to contribute to retirement accounts such as a Roth IRA. The maximum contribution for a Roth IRA is $6,000 in 2019 if you meet the requirements and are under age 50. It’s quick to set one or contribute to it if you already have a brokerage account open. When you’re struggling with money, paying yourself is probably the last thing you do each month if you have anything left at all. That means you might be saving $100 one month, $500 the next month, and $0 the following month. One way to ensure that you always save something for yourself is to automate your savings. A certain amount is deducted from a designated account and placed in a separate account without you having to do anything. You just need to set it up and you’ll find yourself saving without even thinking about it. Next is to automate your bill paying. You’ll never miss another bill payment and be subject to late fees because payments will automatically process for you. To do this, log in to your bank or credit card website, locate your payment options, and select the option to automate payment. An emergency fund covers or lessens the burden of an unexpected expense. It’s generally recommended that you have 3-6 months of living expenses set aside in your emergency fund. Don’t be discouraged if you have a small fund or none at all. You can get started with any amount and grow your fund from that. A good place to put your emergency fund is into a high-yield savings account, where it will earn interest but be available to you right away when you need it. Do you have some gently used clothing, accessories, or household items that you don’t want anymore? Snap a few pictures of your items with your cell phone and put them up for sale. Sites and apps like eBay, NextDoor, Letgo, Poshmark, Facebook groups, and Mercari make it fast and easy to list items. You may have to spend more time packaging items for shipment or meeting potential buyers, but creating listings is fast and easy. Meal planning is life-changing. It has helped me save so much time and energy. I’m no longer as stressed about what to cook for dinner each night either. If you already have several dishes in your regular rotation, pick out a few for the week and make a grocery list to shop for the ingredients. It may take more than 15 minutes to plan a week’s worth of meals if you’re new to meal planning. Start by planning at least one meal and then deciding on more meals as you get more comfortable with it. If you want to save even more money, plan to make meals using the same few ingredients so you can buy them in bulk and have fewer leftover ingredients going to waste. Once you have your meals planned for the week, make a list of the groceries you will need. Then stick to the list when you go shopping. This will keep you from spending on extra items that you don’t need and may go to waste. For a nice surprise, visit Missing Money to see if you have missing, lost, and unclaimed money and assets. It’s not too hard to get started improving your finances. You can start in just 15 minutes a day! What are some quick and easy ways that you’ve improved your finances?